I don’t know why I have decided to watch every Elvis movie. I just want to. I’m generally interested in these 31 movies because they are a crucial part of a phenomenon that can’t be replicated today. The only artist today whose star persona even comes close to Elvis’s is maybe Justin Bieber. But just barely. 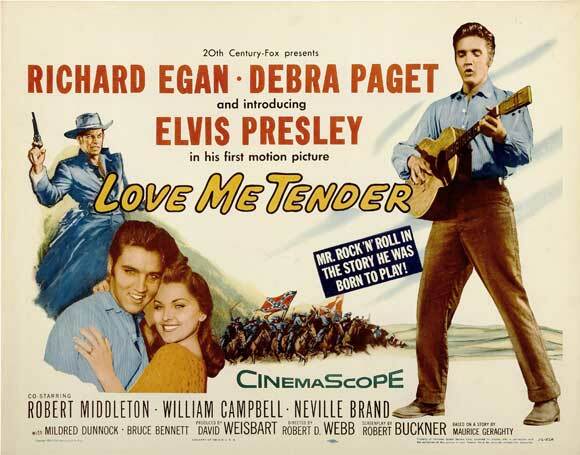 Love Me Tender, released in November 1956, is the first film to capitalize on Elvis’s growing star. It does so by adding outlandish music performances to the post-Civil War drama. Though entertaining, the performances of “Let Me”, “Poor Boy”, and “We’re Gonna Move,” barely fit with the film’s diegesis. Elvis doesn’t appear until 20 minutes into the film, following a long exhausting set up. The three Reno brothers, Vance, Brett, and Ray, have been fighting for the Confederacy. They rob a train carrying federal wages, unknowingly just after General Lee’s surrender. With stolen federal money in hand, the brothers decide to reunite with their family. During the war, the Reno brothers also misplaced their shirts. To be fair, it was a long war. Then Elvis, who plays Clint Reno, finally appears and brings much needed life to the dragging storyline. Although his part seems secondary, Presley’s presence in Love Me Tender quickly eclipses everything and everyone else in the movie. Clint stayed home to run the farm while his brothers fought in the war and he is ecstatic that his brothers have returned. But his brother’s return is about to complicate the homestead. Vance (Richard Egan) was declared dead sometime during the war, a mistake no one in the Confederate Army realized. (This could explain why the Confederacy lost.) 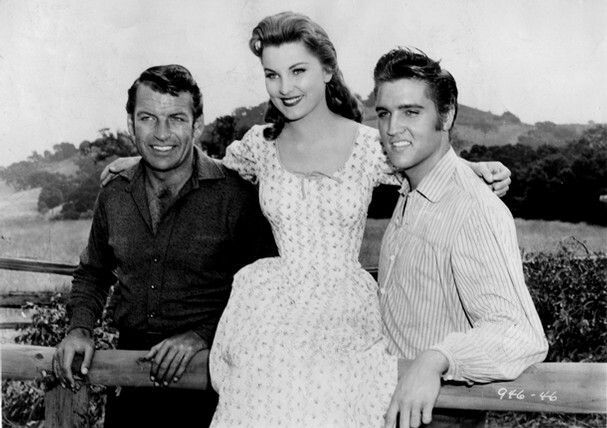 Because the family believed that Vance had died, Clint married Vance’s girl Cathy (Debra Paget). Awkward. Also, I think this makes Cathy a cougar. Federal agents then arrive in BlueBell to arrest the Reno brothers. No one believes that the brothers could have committed the crime and it becomes clear that Clint idolizes Vance, further making his marriage to Cathy strange. The idea that Elvis is biologically related to these people is also strange. Wanting to help his brothers, Clint joins some of their army friends (henceforth known as Team Confederacy), who also have a stake in the stolen money. They attack the train that is transporting the brothers to jail and Vance becomes upset that Clint is now involved. Well, Vance, what did you expect him to do? The poor boy (pun intended) didn’t get to fight in the friggin Civil War. Clint just wants to shoot a gun like a real man. Much to the displeasure of Team Confederacy, the brothers decide to return the money and strike a deal with the authorities. Meanwhile, federal agents spend some quality time searching the Reno’s house for the stolen money and ogling Cathy’s breasts. And so, boring plot A – the Reno brothers stole federal money – and boring plot B – Cathy still loves Vance even though she’s married to Clint – finally come together. Team Confederacy convinces Clint that he is just a pawn in his brother’s quest to win Cathy back; Vance has clearly run away with the stolen money and the girl. Clint becomes irrational and runs off with Team Confederacy. At this point, I realized that Love Me Tender is the type of movie I shouldn’t watch because I get easily distracted by ridiculously pointless details. Seriously. Where’s the money? Who does Clint trust? What is the purpose of the two other Reno brothers? How everyone else find the secret hideout except the Federal agents? Is Cathy’s blouse missing a button or did it come like that? Of course what really matters is that Clint’s manic episode leads to a shootout between Team Confederacy and Vance. And (spoiler alert) Clint dies. At the end of Love Me Tender, you are serenaded by ghost Elvis. This is supposed to be comforting to distraught audience members. This is the only film in which Elvis dies on screen. Apparently, his mother and fans couldn’t handle this, so Elvis promised to never die on screen again. Love Me Tender was intended as a serious, dramatic venture for Presley. But much of the film was changed to capitalize on Presley’s sudden stardom. Thus beginning the Elvis persona and pushing him towards unprecedented fame. I often asked myself, “Elvis, what are you doing here?” This reaction wasn’t unexpected. Jailhouse Rock, Viva Las Vegas, and Blue Hawaii all left me wondering the same thing. I’m going to have this reaction at least 30 more times, aren’t I? Elvis claimed that his fans’ response to his movies prevented him from being considered a serious actor. Yeah, that’s the reason.